The water from the inside of young coconut is used as a drink. This might be in the form of the " coconut water" alone, a mix of water, coconut extract and sugar or a mix with coconut water (70%) with sugar ( 25%) and young coconut flesh in small pieces added ( 5%) see: " coconut drink" . When the coconut gets more mature, the water is not so tasteful anymore, and the flesh get thicker. This flesh is sold together with syrup as "coconut meat in syrup"
- grated through a rotary wedge cutter. From there again two ways are possible: squeezed in a screw press to extract the coconut cream or dried as desiccated coconut. The coconut cream is often diluted to coconut milk in the several grades in fat level. Another way is to press the grated coconut several times, every time to get a lower % of fat in the end product. Te left over grated material is used as low fat desiccated coconut. The desiccated coconut is also grinded and pressed to blocks, called creamed coconut (blocks). Coconut cream and milk are the opaque liquid made from the pressed shredded mature coconut meat. It is a natural oil-in-water emulsion of fat-protein-water, milk-like white in colour and has a creamy viscosity. This is not physically stable due to the insufficient quantity and quality of the natural proteins present. It separates into a cream and serum layer within 5 to 10 hours after production. Therefore stabilisers and emulsifiers have to be used to keep the fats dissolved in the water. The higher the fat level, OR the more additives have to be used OR the acceptance to get a separation layer in the top of the packing. This might even be a hard top layer formed on the surface because of the solidification of the oils in the coconut milk. The chemical composition of coconut milk shows variations due to differences in factors such as geographical location of the nuts, the maturity of the nuts, the method of extraction and the degree of dilution if water or liquid endosperm is added during extraction. Further coconut milk contains carbohydrates, mainly sugars and starch, and minerals, such as phosphorus, calcium and potassium. The dominating proteins in coconut milk are albumins and globulins, and the protein content of the undiluted milk ranges from 5-10% on dry basis. Coconut milk is available in several fat levels. This starts with 5-7 % ( "low fat"), via 8-10% (economy), 12-14% ("medium"), 16-18% ("gastronomy") till 22-25 %: ("super premium"). The highest fat level ( 25.4 % and above) is called "coconut cream". As coconut milk is made from natural raw material, which properties vary among crops, harvest places, varieties and time of the season, a spread of fat content of + / - 1% is caused despite a strict recipe and production process. Aside of the Codex STAN 240-2003 there are no world wide official standards. The Thai grades were already standarised by TIS 582-2528 (1985). Coconut milk is a 'child of the tropics". In cold storage ( + <?xml:namespace prefix = st1 ns = "urn:schemas-microsoft-com:office:smarttags" />10 C ) the coconut milk may de-homogenize, as creamy foam from the coconut milk might separate from the coconut water as a natural process. Also some protein skins or chips may develop. If the SO2-residue as preservative goes low, those protein skin might turn into a darket chip at the surface during the heat treatment of the sterilisation process. Coconut milk can be used in nearly any dish to give it a coconut taste: boiling vegetables, frying meat, as a base for soups, stews, curries and sauces, drinks, ice-cream, in bakery and deserts. The low fat levels are especially used by those consumers who like to give their foods a coconut taste, with keeping the fat intake lowest. According to Wikipedia: Coconut milk is a common ingredient in many tropical cuisines, most notably those of Southeast Asia (especially Burmese, Cambodian, Filipino, Indonesian, Malaysian, Singaporean, and Thai), Bangladesh, parts of India (notably South Indian and Western Indian), as well as Brazilian, Caribbean, Polynesian, and Sri Lankan cuisines. On Internet many sites give a LOT of possibilities HOW and WHERE to use coconut milk. 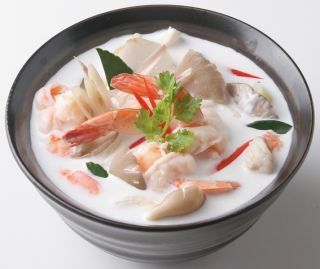 Frozen coconut milk tends to stay fresh longer, which is important in dishes in which the coconut flavor is not competing with curries and other spicy dishes. Coconut milk is packed in cans of 0,165 - 0,425 ltr, A10 cans of 2,9 ltr, tetra packs 0,2-0,25-1 ltr, in big roto-sterilised cans of 18 kg, in aseptic bags of 20 kg and in frozen 20 kg bags. In this latter no additives at all are needed. Coconut milk is in fact a vegetable oil + fat mix with water. We all know, fat and water do not stay in a mixed solution, only by adding emulsifyers and stabilizers, this can be made possible. To ensure a long shelf life all any possible remaining bacterial contamination has to be killed by sterilisation: a heat process to during a 60 min. However, the heat will, at the same time, destroy the physical appearance of the product as well. It will cause such reaction that will develop brown color to the product. Sulfur Dioxide is added into the product during processing to prevent such browning reaction. The most common form of Sulfur Dioxide used in the food industry is Sodium Metabisulfite (E223) (Na2S2O5) and Potassium Metabisulfite (E224) (K2S2O5). These additives are added not to preserve the food, but to help preventing brown color. For coconut milk, Sodium Metabisulfite is added at the beginning of the process at approximate 0.02% or 200 ppm. However, most portions will deteriorate during the heating process. The final residue of Sulfur Dioxide in final product will be around 10 - 30 ppm. According to the EU food Law, Sulfur Dioxide residue must be declared as allergene if at consumption the level exceeds 10 ppm. In case the residue has to be below 10 ppm, the coconut milk in the can and tetra will turn a little gray. 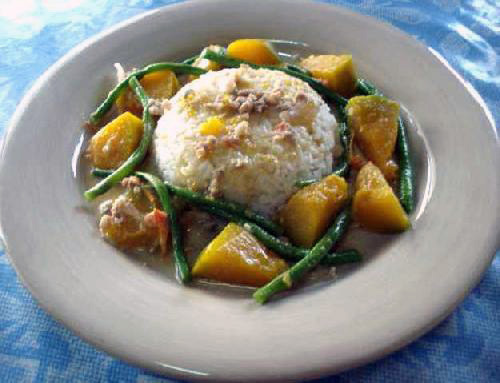 - Stirring the coconut milk with a spoon, its texture should be smoother and more homogenized. When in cold whether, you may have to stir harder. After you stir hard and long enough, the final coconut milk must be a white creamy homogenized liquid. Coconut cream powder, also called milk powder, is a free flowing white powder made from pasteurized, homogenized and spray dried natural extract of mature coconut kernel. The dehydrated coconut milk powder retains the natural flavours, texture and nutritive values of fresh coconut milk. The coconut milk powder has good shelf life and excellent instant properties in water. It is a superior natural coconut flavouring enhancer, which can be used as an ingredient for many fish, shellfish, meat, poultry, vegetable dishes, confectioneries, sweets, beverages and other type of preparations, creamy filling for confectionery products. Low in fibre content ensuring a smooth texture for the final product. Used after reconstitution in water to become coconut milk before application, or be added directly to the ingredients without having to reconstitute in water. Since this is the coconut milk without the moisture, you can control when you make a curry, pudding, or sauce just how rich and thick it will be. In many cases it can be used as (partial) replacer of cow milk to give the end product a special coconut flavour. Creamed Coconut is the unsweetened dehydrated fresh meat of a mature fruit of coconut, ground to a semi-solid white creamy paste. Creamed Coconut is suitable for consumption without the need for further processing. Please do not confuse between Creamed Coconut and Coconut Cream. Coconut Cream ( in fact the pure but liquid extract frm the white coconut meat has maximum moisture content of 74.6% whereas Creamed Coconut has moisture content of 3% maximum. Creamed coconut is creamy white colour and tastes rich, creamy and mildly sweet with the essence of coconut..
Creamed Coconut is moulded in to a convenient block to give a ready alternative for either fresh or desiccated coconut. It dissolve easily in warm water to provide a substitute for coconut cream or milk (approx. 50g creamed coconut dissolved in 150 ml water is equivalent to 1 tin 400ml coconut milk. Creamed coconut gives a rich, creamy flavour to curries, cakes, biscuits and desserts. It is solid but soft and can be grated, sliced, chopped, melted and dissolved. It is easy to add creamed coconut into a meal toward the end of cooking, just stir in. Creamed coconut is made by forming fresh coconut into a solid block. It is reconstituted by adding boiling water. To use creamed coconut, chop into pieces and add boiling water. You can also add the pieces of creamed coconut straight into the cooking pan. Creamed coconut can usually be used in place of fresh coconut in many dishes including Thai and Indian dishes. It can also be used when making chutneys, or in fact in most recipes that require coconut, coconut cream or coconut milk. It has a handy thickening effect on sauces, and is as flavour some as fresh coconut. Desiccated Coconut is a grated, dried (3% moisture content max. ), and unsweetened fresh meat or kernel of a mature fruit of coconut. Desiccated Coconuts are graded by its cutting size, for example, fine grade and medium grade where fine grade is smaller particle size than the medium grade. Coconut flour is a food-grade product produced from fresh coconut meat which is dried, defatted and finely grinded to produce the flour. It is a high-quality protein product that is processed at regulated temperature and pressure without any chemical treatment and preservatives. It has a low fat content of 10% and mesh size of 80. Coconut flour is cream-colored, has bland taste and less nutty odor due to its reduced fat content. The fatty acid content of coconut flour is mostly lauric (48.4%) and myristic acid (19.78%). Unlike wheat flour, coconut flour offers a good amount of essential amino acids. Coconut oil is an edible, tropical plant oil that is derived from the coconut palm, a tree crop that is native to the tropics. For numerous centuries, it has been a traditional dietary staple of populations living in Asia, Africa and the Pacific islands. Today, its uses in food have been adopted by people all across the world. However, before incorporating coconut oil into your diet, it is important to keep in mind that research on the health effects of coconut oil are still ongoing. Coconut oil can be taken as a source of dietary fats. Jon J. Kabara, Ph.D., of the University of Michigan recommends using coconut oil as a healthy culinary alternative to animal fats. This is because the fats in coconut oil are in the form of medium-chain fatty acids, which are beneficial to your health. Animal fats, on the other hand, are in the form of long-chain fatty acids, which tend to raise cholesterol levels and cause heart disease. In his book �The Coconut Miracle,� Bruce Fife, Ph.D., notes that coconut oil is added to most baby formulas. This is because of its high lauric acid content. He reports that lauric acid is an essential component of mother�s milk, and serves to improve nutrient absorption, aid digestive function, help regulate blood sugar levels and functions as an antimicrobial and anti-parasitic agent to protect the baby from infection. The lauric acid in coconut oil serves the same purpose when added to baby formula. Coconut oil is widely used in tropical regions as a cooking oil. Fife writes that this oil is a healthy choice for cooking and frying because it has a relatively high smoke point of 360�F. As such, unlike other cooking oils, it can be heated to high temperatures without forming trans-fats. Furthermore, since it is slow to oxidize, it is resistant to rancidity and has a much longer shelf life of up to two years. Coconut oil is considered to be a functional food because incorporating it into your diet provides more than just nutritional benefits. In a monogram on coconut oil, Mary G. Enig, Ph.D., F.A.C.N., notes that coconut oil contains a number of physiologically functional components that have non-dietary, health-supporting functions. One such component is lauric acid. She cites recent research studies showing that lauric acid has unique properties in food use that are related to its antibacterial, antiviral and anti-protozoal functions. Capric acid is another one of the fatty acids found in coconut oil, which has been shown to have antimicrobial properties. Virgin coconut oil is one of two types of coconut oil available. Virgin coconut oil is extracted directly from the fresh kernel of the coconut, while refined coconut oil is obtained from the coconut�s dried kernel, or copra. Virgin coconut oil undergoes minimal processing and retains its natural scent, taste and color. Refined coconut oil undergoes more extensive chemical and mechanical processing in which it is refined, bleached and disinfected. Virgin coconut oil is a natural, versatile plant oil that is obtained from the fruit of the coconut palm, Cocos nucifera, a tree that is indigenous to Polynesia, Malaysia and southern Asia. Today, there is growing interest in virgin coconut oil as research uncovers the various health benefits that it has to offer. Virgin coconut oil is described by the Philippine National Standard for Virgin Coconut Oil as a colorless and sediment-free oil that has a fresh, natural coconut aroma and is free from rancidity. Coconut oil is usually in liquid form at room temperatures that are at or above its natural melting point of 76 degrees Fahrenheit. However, because of its high saturated fat content, virgin coconut oil solidifies at temperatures that fall below this its melting point. Coconut oil is largely composed of highly saturated fats called medium-chain fatty acids. According to Dr. B.M. Hegde, Chairman of State Health Society in India, just over 50 percent of the oil is a medium chain fatty acid called lauric acid, and between 7 and 10 percent is capric acid. When ingested into the human body, lauric acid is converted into a unique compound called monolaurin, which is a healthy fat that can only be found in coconut oil and breast milk. Virgin coconut oil is classified as a functional food, which means that it provides health benefits that go beyond mere nutrition. The fatty acids in this oil are a source for both nutrients and antimicrobial compounds called monoglycerides, which help fight viral, bacterial and fungal infections. Aside from ghee, a type of clarified butter, no other fat falls into this classification. Dr. B.M. Hegde notes that for thousands of years, coconut oil has been utilized for a variety of purposes. It is widely used as a culinary oil, and is especially well-suited for frying because it has a higher smoke-point than most animal cooking oils. The oil�s moisturizing properties are beneficial for both cosmetic and therapeutic skin applications and healthy hair. Regular use of the coconut oil as a dietary fat helps to regularize cholesterol levels in the blood. The second type is refinedcoconut oil, and the difference between the two is in the processing that each one undergoes.